I work at three jobs - Nature Artist and Workshop Instructor as my business and Coordinator for Spring Island's Nature & Arts events. For the most part I work out of my home but when I have to go into 'the office' it's located at Spring Island's Nature Center. I pinch myself every time I cross the causeway to Spring Island. It's a 3,000 acre nature preserve with a residential community that's been carefully woven into the natural landscape. 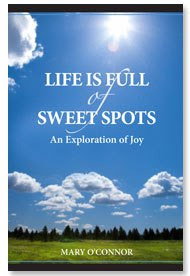 I'm continually inspired by the beauty there. 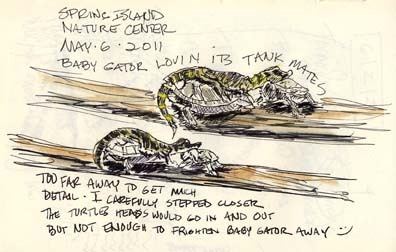 When I enter the back door of the Nature Center I walk past tanks occupied by various snakes and at the end of this room is a large tank containing two baby American Alligators, a constantly hungry Terrapin and a couple of Chicken Turtles. On this day I witnessed a special treat.... A baby gator lounging atop of two chicken turtles. I walked slowly toward the tank but didn't dare get too close. My co-workers are getting used to me taking an art break :) And, being conscious of 'the clock' I sketch really fast.... great practice :) I added color today. Below is the original sketch. You'd think those turtles would make nicer snacks than a bed!! Fun sketches, Pam! I'm going to have to get back to Beaufort and visit soon. I've missed that area! Amazing how kids can always get along.... even in wild life! Do come to Beaufort!! So do these alligators eat these turtles when they get a bit bigger? This is certainly a cute picture of them all. Afraid so, Freebird. But, the turtles must know when a gator is hungry as I've seen them all lounging near each other in the sun on banks of lagoons.